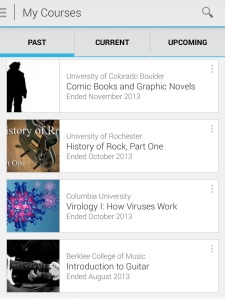 Coursera has been gaining popularity in recent years, making free quality education available worldwide. 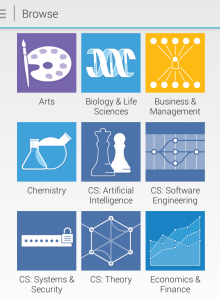 Coursera is one of the several platforms that currently offer MOOC (Massive Open Online Course), free high-level courses for large groups of students (thousands of people). The courses are offered by universities from several countries, and have a level comparable to traditional classic courses. The topics cover all possible fields, from the most advanced topics in science and technology to the arts and literature. All courses have a similar format, are completely online and last for a few weeks. Currently, Coursera has an offer of over 600 courses, given by more than 100 institutions in several countries. While most are in English, a growing number of them are presented in other languages such as Spanish, French, Chinese, Japanese or German. The Coursera app for mobile devices allows us to follow these courses from our smartphone or tablet, increasing the learning flexible. Through this app you can choose new courses, register them and follow the lessons in streaming (or download the videos to watch them offline). It also lets you to download the course materials and receive notifications. There are still some features that are not available, such as the forum, the extra materials or quizzes and exercises, but the Coursera has already announced that they will be implemented throughout the year. If you like want to learn but you don’t have much time, Coursera offers high-level training in a completely flexible way. The courses contain several tests and exams to evaluate the work done, and if we pass the course, Coursera will give us the corresponding Certifying of rovement. The aplicaciónestá available in 12 languages (including Spanish and Catalan). You can download it for iOS and Android from the App Store and Google Play respectively. More information at Coursera Blog.